It is without doubt that Honeywell has a very strong line-up of home air-purifiers, across multiple price points. Right from the Honeywell Air Touch A5 (around Rs10,000) to the Air Touch S8 (around Rs30,000), there are purifiers at almost every price point. What stands out is that lesser priced options don’t compromise on filter quality and tend to have a lot of the same DNA as their more expensive siblings. The latest addition to Honeywell’s portfolio is the Air Touch i9 air purifier. It is priced at Rs22,990 and incidentally is priced very close to the Air Touch i8, priced around Rs18,000, which is excellent in its own right. The Air Touch i9 looks a lot like the Air Touch i8, and if you don’t really know the difference between them, you’d probably mistake one for the other. But then again, why redesign the wheel again, considering the Air Touch i9 carries forward the design which works well. The highlight is the anti-fall mechanism which prevents the purifier from toppling over after an accidental brush against it. If you have a naughty child at home, chances of them scampering over in their walker and pulling down a purifier are quite high. The result could unfortunately include the child getting hurt and the purifier getting damaged. 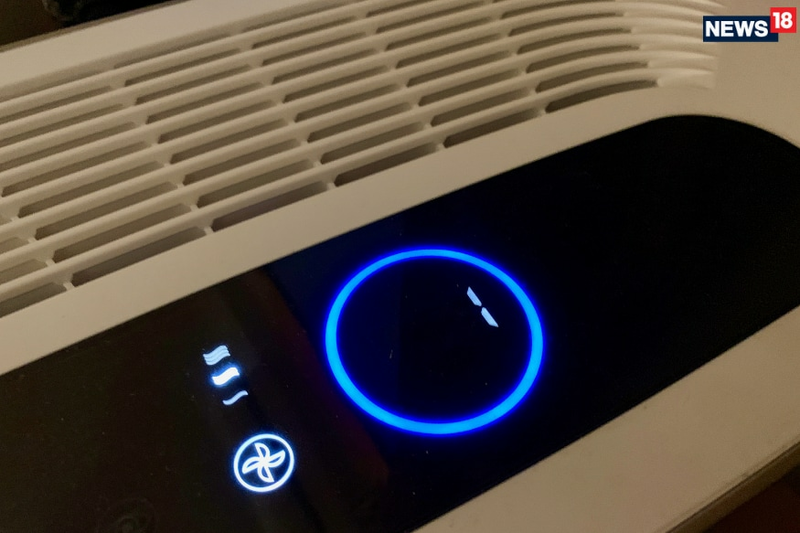 We have experienced this at home, and we found our little one has managed to dislodge a lot of air purifiers from the pedestals, but the Honeywell Air Touch i9 remains safe—despite the best attempts to the contrary, mind you. Full marks to Honeywell for thinking this through. Apart from that, the rest of the elements remain the same. The clean polycarbonate chassis, the brushed finish and the control panel as well as the clean air vents at the top. There are touch-enabled controls on the top panel for power on/off, fan speed, sleep mode, for instance. There is also a PM 2.5 indicator which updates in real time to indicate the air quality in the room. In the Air Touch i8, all lights on this cluster go off once you enable the sleep mode. In the Air Touch i9, Honeywell have gone a step ahead and added an even smarter automatic monitoring mode. Here, if the PM 2.5 level is lesser than 25 µg/m3, the Air Touch i9 goes into the power off stage, though it continues to monitor for any changes in the ambient air quality. If the sensors detect that the air quality changes, it will automatically turn on. All lights on the control panel at the top turn off automatically after a duration, and not just in sleep mode. There is the option to manually set the fan speed, if you aren’t entirely enthused by the smart automatic mode, and want the cleaning to happen constantly. The Air Touch i9 is most certainly a powerful air purifier. It can clean the air in rooms as large as 415 sq. ft. (38.5 square meter), which is up from 387 sq. ft (35.9 sq. m.) rating of the Air Touch i8. It has a clean air-delivery rate (CADR) of 300 cubic metre per hour, which incidentally is the same as the much more expensive Air Touch S. In our testing which we monitored with a third-party air quality monitor, we noticed that in 30 minutes of running in a 20 square meter room, the air quality improved from an unhealthy 193 µg/m3 of particulate matter (PM) to 32 µg/m3 PM and then stabilized around 22 µg/m3. We left this in the smart automatic mode, and the air quality was maintained well around the 22 µg/m3 mark despite movement of people in and out of the room. Smart design elements also contribute to the Air Touch i9’s fantastic performance. The Air Touch i9 takes in air from the base of the front panel (filters inside are placed at a downward-looking angle if you look closely)—and this is something that has passed down the generations, since the larger and more expensive Air Touch S8 also offered the same design cues. After running through these filters, the clean air exits through the large vent at the top. In our opinion, this is definitely more efficient than a lot of home air purifiers which have air intake vents on the back panel. This way, distance to the wall at the back and the placement of furniture on the sides has a huge bearing on performance. Second, we have praised the quality of filters that Honeywell uses in all of its purifiers, and that status quo remains with the Air Touch i9 purifier as well. There is the excellent pre-filter which catches the larger particles efficiently, a thick HEPA filter and finally a very high-efficiency HiSiv filter with a unique honeycomb design which cleans up particulate matter as small as 0.3 um and removes formaldehydes (found in building materials and many household products), volatile organic compounds (vapours and gases) and odour. It is worth observing that the pre-filter in this purifier is extremely efficient as compared with a lot of its rivals, and that enhances the life of the HEPA filter as that doesn’t get clogged with the larger dust and polluting particles over time. The replacement filters are quite affordable as well. The HEPA and HiSiv combination filter is priced at Rs2,999 (on Amazon.in), and this will require replacement anywhere between 6 months to 1 year, depending on how bad the air quality tends to be in your home on a regular basis. We are quite happy about the fact that Honeywell has not changed much in terms of the design—what isn’t broken doesn’t need to be fixed. Secondly, the new smart automatic mode monitors the air quality well, and the fact that it moves the purifier into a very low power state not only saved on electricity consumption, but also extends filter life by not passing air through them when not necessary. However, we notice that once it goes into the low power mode, it only really kicks in when the air quality is around the 75 µg/m3 mark. Quite frankly, we would have preferred to kick into action earlier. The Air Touch i9’s genuine competition comes from the Philips 2000 Series AC2887 (around Rs18,000), which also has similar powerful performance, an excellent set of filters, and simple to use controls. It is tough to choose between the two, really, and the finally decision could rest on your personal preference.